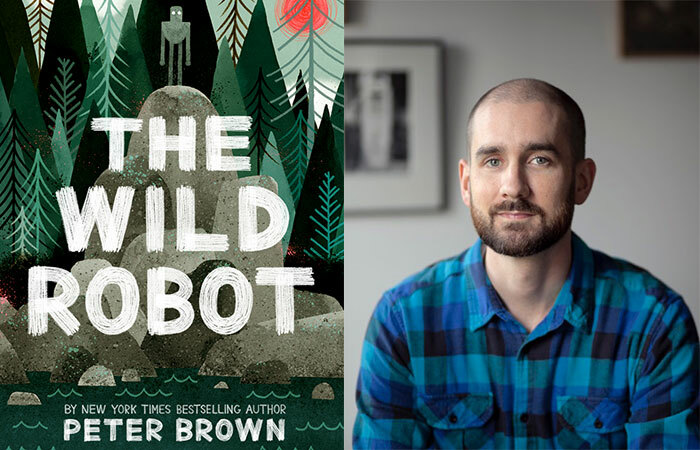 Peter Brown’s Wild Robot is a touching, exhilarating, smart and touching grade school book. Although Roz is a robot and cannot feel, “as you might know, robots don’t really feel emotions,” her love for her little goose is unmistakable. “What?” you might be asking, “a robot and a goose?” The answer is “yes”, and to the reader nothing could feel more natural or endearing. ROZZUM unit 7134 is a programmed work robot who finds herself marooned on an island. The ship carrying her and four other similar robots has crashed and she is the only survivor. She watches the creatures and studies the land and tries to find her place in it. One day while she is exploring she accidentally knocks down a goose nest. One egg remains and she cares for it, committed to saving this bird. When the goose is born it assumes that Roz is his mother. She fights the role at first but then embraces it fully teaching Brightbill to swim and fly and socialize with other geese. The story also has a sense of adventure as we discover the world with Roz and then with Brightbill as he ventures off into the world on his own. The last third of the book amps up even more as a group of robots come to the island to find Roz and will do so at any cost, including shooting anything trying to protect her. Partly a parental love story, partly a nature survival tale and sprinkled with illustrations, this book is a real page-turner. Can a robot override their programming with love? She can learn the language of the animals but can she really be a part of their world? It questions if someone is a monster just because they’re different and compares city life to country life. This books lends itself wonderfully to discussion. I shared it with the 3rd-5th grade book club at the library. We had ten kids read it and they all loved the book. I brought in an assortment of cardboard boxes and we “made” Roz. Some kids even added her broken foot at on/off button! Next “Reading Without Walls Challenge” Winners at Tomball Library – Will You Take the Challenge?